Racial and Educational Segregation in the U.S.
Where you grow up is consequential. It plays a critical role in shaping who you are likely to become. Where you live affects your future earnings, how much education you’re likely to receive, how long you live, and much more. Sociologists who study this are interested in the concentrated accumulations of specific types and qualities of capital (economic, cultural, social) found in abundance in certain locations, less in more, and virtually absent in some. And, as inequalities intersect with one another, marginalization tends to pile up. For instance, those areas of the U.S. that are disproportionately Black and Latino are also areas struggling economically (see Dustin A. Cable’s racial dot map of the U.S.). Similarly, those areas of the country with the least upward mobility are also areas with some of the highest proportions of households of people of color. And, perhaps not shockingly (although it should be), schools in these areas receive fewer resources and have lower outcomes for students. How much education you receive is, in part, a result of where you grow up. Think about it: you’re be more likely to end up with at least a bachelor’s degree if you grow up in an area where almost everyone is at least college educated. It’s not a requirement, but it’s more likely. And, if you do and go on to live in a similar community and have children, your kids will benefit from you carrying on that cycle as well. Of course, this system of advantages works in reverse for communities with lower levels of educational attainment. Recently, a geography professor, Kyle Walker, mapped educational attainment in the U.S. Inspired by Cable’s map of racial segregation, Walker visualizes educational inequality in the U.S. from a bird’s eye view. And when we compare Walker’s map of educational attainment to Cable’s map of racial segregation, you can see how inequalities tend to accumulate. Below, I’ve displayed paired images of a selection of U.S. cities using both maps. 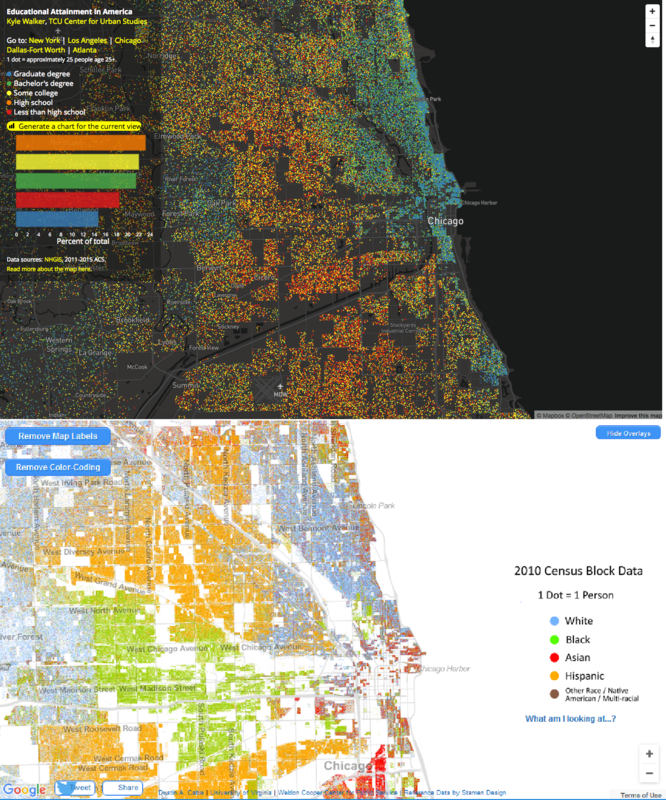 In each image, the top map illustrates educational attainment and the bottom visualizes race. On Walker’s map of educational attainment (top images in each pair), the colors indicate: less than high school, high school, some college, bachelor’s degree, and graduate degree. 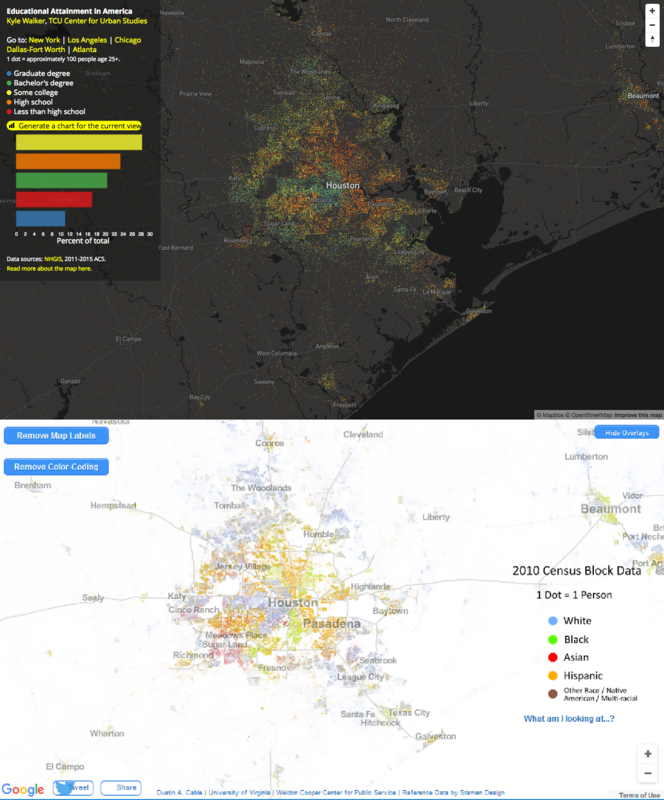 On Cable’s map of racial segregation (bottom images in each pair), the colors indicate: White, Black, Hispanic, Asian, and Other Race/Native American/Multi-Racial. So, one way of comparing the images below is to look at how the blue areas compare on each map of the same region. Urban/rural divide–people with bachelors and graduate degrees tend to be clustered in cities and metropolitan areas. 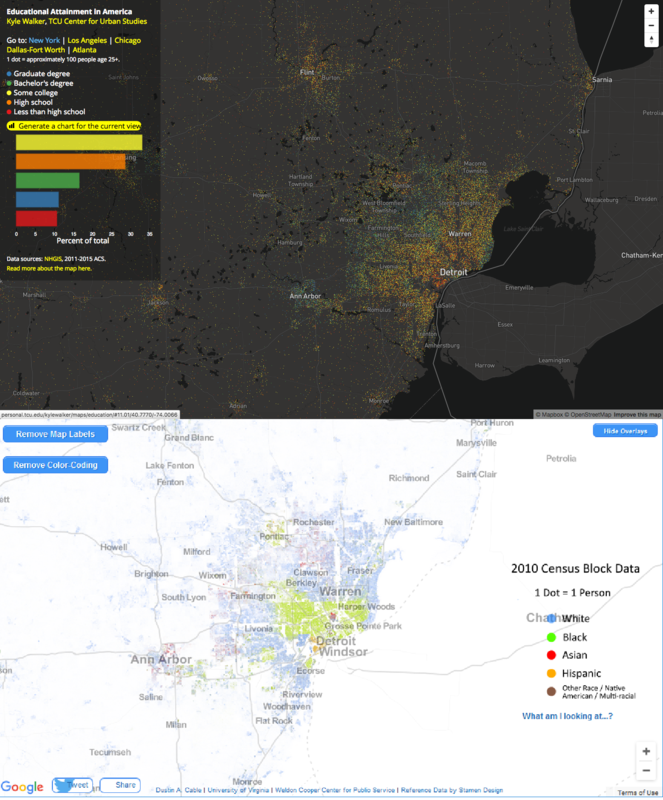 Racial and economic inequalities–within metropolitan areas, you can see educational achievement segregation that both reflects and reinforces racial and economic segregation within the area (this is what you see above). And, as research has shown, the levels of parents’ educational attainment within an area impacts the educational performances of the children living in that area as well. That’s how social reproduction happens. Sociologists are interested in how inequalities are passed on to subsequent generations. And it is sometimes hard to notice in your daily life because, as you can see above, we’re segregated from one another (by race, education, class, and more). And this segregation is one way interlocking inequalities persist. "Where you grow up is consequential." is, in fact wrong. In a modern, commercial society, where you live in terms of resources and--often--opportunity isn't consequential. Most of the people you are talking about are a few minutes car ride from each other, or a little longer on the bus. What is consequential is WHOM you grow up with and what their influences are on you.
" as research has shown, the levels of parents’ educational attainment within an area impacts the educational performances of the children living in that area as well. " Isn't really about location, it's about social and cultural networks. Likewise, if you compare other, insular populations like the Jewish populations in Europe which often are very physically distant from each other but quite close in terms of culture, you see comparative results for things like economic success based on culture and not on location. However, you can use location as a shorthand for "neighborhoods" as in first order non-familial social networks. And, when you do so in places like Chicago, you find the failures upon which the crime rate revolves. So, like the semi-fictional Longshanks said in Braveheart: "The trouble with Scotland, is that it is full of Scots" describes both his problem in the film and the sort of relationship you're talking about here. Location is irrelevant until you consider the population, their relationships, and the like. The differences--urban/rural divide, racial and economic inequalities, etc.--are not due to location but self-organization of cultures. Unless or until you move people around AND integrate them into the new location's culture, you won't see much change, only a reactive move (over time) of the cultures into other self-organizing areas. Carl, I feel that you are leaving out way too many variables here. Self-organization of cultures comes second to location. A certain location may be the foundation for socio-economic barriers to upward mobility, no matter which culture 'self-organizes' there. Good post! Racial discrimination is rapidly seen in educational instructions in the U.S. The social research representing through this article, is to some extent the real scenario of racial and educational segregation in the U.S. Anyway, I am an academic writer on GradeFixer. I work with college students. And so I can feel better this social crisis when discussing with them.